I made 2 new stamps this week, Tony the tiger and Stripey the cat. Toni looks like he has been crossed with a rhino, so I think I need to do a bit more work on him! And I am showing more of the photos taken last week in Duisburg. The first part of the photos can be found here. In my next post I will, show more pics, including those of the historical part of the harbour, dating back to the 8th century. Lovely page of family photos. I thought in 'those days' they never smiled in photos so this proves me wrong/beautiful layout. eine wunderschöne Familieseite mit einem tollen Layout!Die Stempeldrucke sind auch so schön geworden. Interessante Fotos von Duisburger Fest und Schifffahrt! Lovely family page and fun stamps. Enjoyed your photos today. I love the beautiful background on your family photo and your relatives smiles, beautiful. The tiger and kitty are all kinds of fun. I enjoyed another great daytrip. When did you move to Germany? May your day be filled with sparkle, sunshine and energy. I moved here when I got married. Beautiful family page. I bet great-grandma and the great aunts were smiling because the boys weren't around! Your tiger and kitty stamps are wonderful. The fountain looks so happy, bet it's a great place to congregate during warm weather. Loved the very modern merry go-round. I enjoyed tagging along on the harbor cruise. Looks like you had a nice weather day and lots to see.The big head statue reminds me of the Face of Boe from Doctor Who :-D Enjoy your day! Love the garden surrounding your happy family, charming! You are really adept at stamp carving, wild designs! Have a great weekend! What a gorgeous background for the lovely photo of your relatives Valerie, really love it! Great new stamps too. Thanks too for sharing all those great photos, it's almost like being there. I LOVE your layout with the picture of your Aunts with all those lovely flowers and the vintage flair. I love the tiger that you carved. I really want to start carving my own stamps. Yours are a great inspiration. Your stamps are just terrific, and so, too, are the Duisberg photos. What a fun time! It is a really happy family photo, your scrapbook page looks beautiful. I loved the photos and it looks like you had a super boat trip, so may interesting things to see and it looks like the weather was kind to you that day. I sincerely apologize for being late today. Life really got in the way of computer time. Your scrapbook page is out of this world. I love the mixed media elements you used, and all the layers you created. I am simply in AWE of these beautiful pages you are creating and this is another one. I was fascinated by the boat trip, the corn silos and the bridges. The railroad cars on the track look very similar to ones in my area. It's amazing how we live so far apart, yet so many things are so similar. BTW, that fountain is COLORFUL and fun to see spraying water. Wonderful family art, great stamps and I love all the photos. Beautiful page with that photograph taking centre stage, capturing a very happy moment in time. Love those hand carved stamps Valerie so organic in design makes them even more fabulous, bet they would look marvellous printed on fabric. You really do spoil us with your vibrant photography!! Love that everyone is smiling in the photo-it seems you don't see that often in the old photos. Gorgeous page! What a fun and colorful fountain. I know this is a place I'd love to visit someday. The harbour ride sounds so nice. Happy PPF! Your family journal page is so beautiful. And the stamps you've made are super, even Tony. It's extremely impressive to me that you are cutting out these fab stamps. Love your journal page! Those stamps are amazing!!!!! Love your beautifully scrapped family journal page Valerie - wasn't that a great photo with all of them smiling. Great photos too - nice artwork on the merry-go-round and the giant head was intruiging. Such an interesting river harbor! And that fountain art...very colorful. Not my cup of tea, but definitely an attention-getter! Glad it was repaired. And I just loved your page with your relatives picture! It's so great! Creative and elegant collage work ~ wonderful photography! Wow, wonderful! 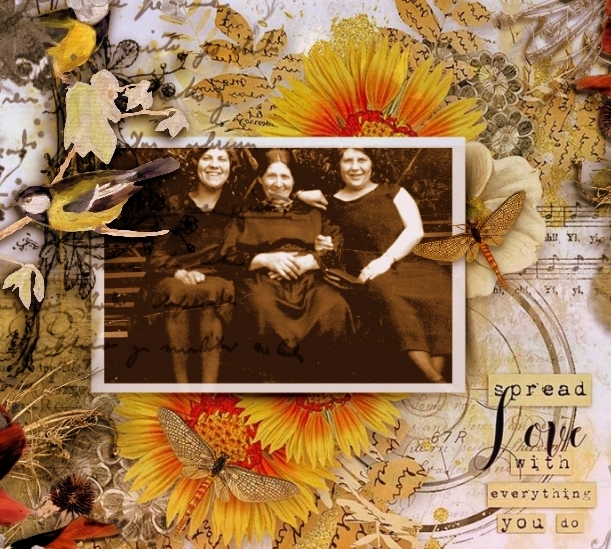 Your family journal page is exquisite...so deeply beautiful!! Love all of the photos! I love old photos, and your page really makes it come to life, nicely done! Happy PPF! Just love your journal page. Wonderful to see your collection of photographs here. Love the old photos. Great stamps. Oh how beautiful your art page is, how wonderful to see your family from times past. The stamps look great and I enjoyed your photos as well. Fascinating art in the city! I love it! You rarely see people smiling in those old school photos...love that your great gramma had such a big smile. Looks like they were having fun! Your stamps are amazing and need to be marketed...truly unique and fabulous! You need to licence them! Wow so impressed! eine tolle family seite und tolle neue stempel die du gemacht hast. in deiner stadt ist ja viel los,danke fürs teilhaben. Another amazing page foryour family album Valerie and I think the way you make the stamps is unique. Hope to see them on projects soon. Wonderful photographs as always and so good to see the fantastic fountain in all its glory. These are amazing, all of them! Very cool, from here, where the snow falls... sigh. Your family album is a treasure and I love your stamps. The cat is a favorited. Looks like a fun and interesting trip this week. Thanks so much for sharing. Happy PPF! I love your happy family art! It's priceless!! I think your stamps are adorable! You made me smile!! What a fun boat tour!!!! Love the pictures! Big Hugs! WOW. Valerie! I absolutely LOVE the scrapbook page you made with this treasured photo. 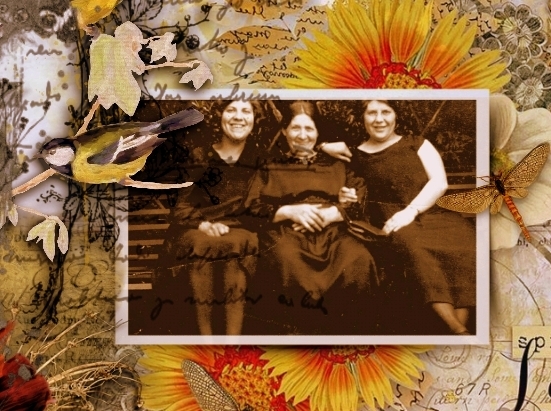 It is so wonderful that you have this of your great grandmother and her 2 daughters. You scrapped it beautifully! And I love your stamps, too! Also, the photos are spectacular! I love them all and am so happy to have traveled with you Duisburg! The family page is lovely. I think it is wonderful that they are all smiling! Not something often captures in photos from that time. LOVE IT! 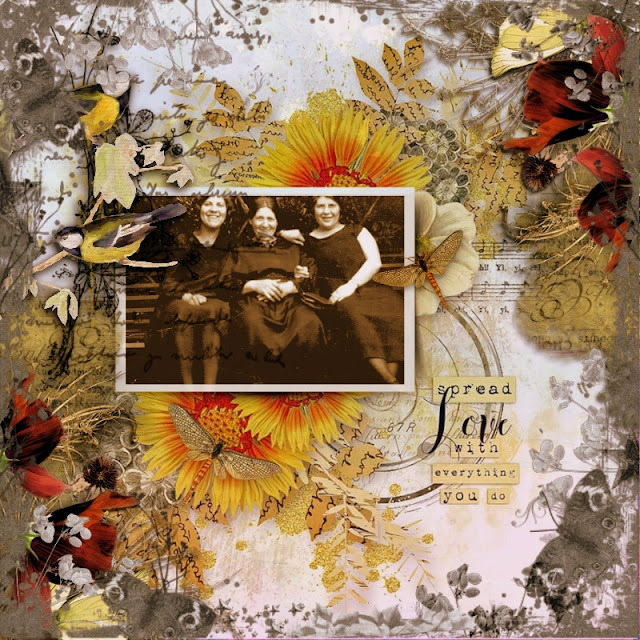 Love the background on the journal page with the bright n beautiful yellow flowers complementing the old photo..the stamps are just cute!